This is the second part of our little series on Toyota gas pedals. 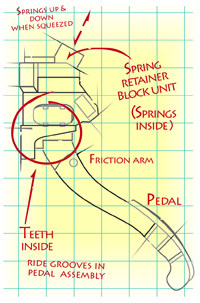 In part 1, we established a basic premise – that friction and spring pressure work together to stabilize the workings of the pedal. We sketched out the CTS-made accelerator assembly and identified spots that might be causing the problem. 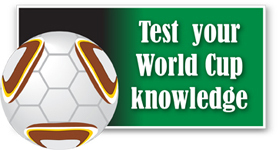 We did more reading on the mechanical aspect of the subject to verify what we knew – or, in some cases, what we thought we knew – and refined the rough drawing according to new information. With more facts based on published reports, we feel we have a good shot at putting together an infographic that explains what matters to many people – what causes the problem and how Toyota intends to correct it. 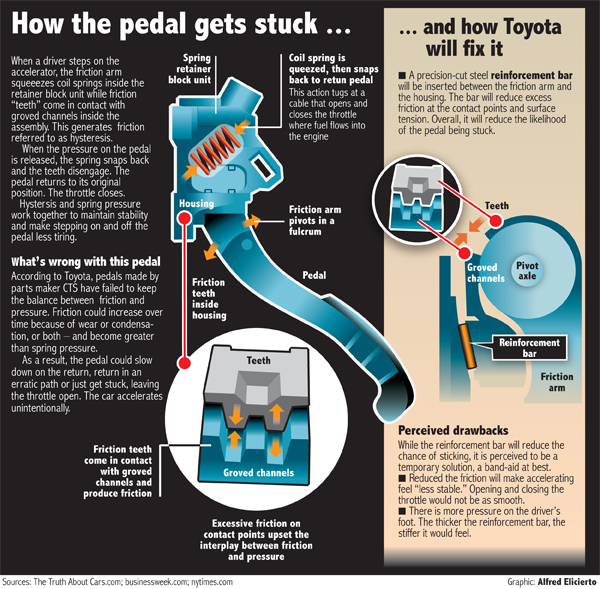 As in any effort of this nature, we are not saying this is a definitive infographic on the failure of the CTS pedal. It is an attempt to break through the noise that muddle the reporting on this subject, the endless quotes from anyone with his ten cent’s worth, and the futility of using words when images work better. The human mind is pretty good at figuring out a vision behind a narrative, but it works best when presented with an image to parse. Based on reports, the solution will be a reinforcement bar inserted between the friction arm and housing. The bar is supposed to reduce friction between the teeth and the grove channels and lessen the likelihood of the pedal being stuck. This remedy is already seen by many as a short-term fix, a band-aid at best, and even Toyota might agree. This is a developing story so we will keep tabs on it.